Ingenious, ultra-compact and supremely efficient, a call centre furniture office comprises of multiple workstations often aligned around a series of central columns, making maximum use of available space. 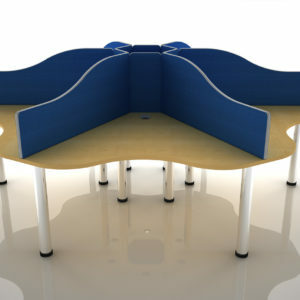 We provide cluster desks, call centre pods, call centre benches. We can configure our call centre pods and call centre clusters to suit any number of team groupings i.e. call team furniture groups of 2 up to 20 call centre staff. We can space plan your call centre to give maximum efficiency and help address acoustic problems in call centres.